Win Salt Lake Gaming Con Tickets! Do you love playing video games? If you are an avid gamer, then you have a chance to attend the Salt Lake Gaming Con! Salt Lake Gaming Con is a 3 day convention that will focus on video games, tabletop games, and cosplay. The convention will feature top game developers from all over the country who will be demoing their games and running tournaments. They will be hosting tournaments for different skill levels so everyone has the chance to participate and have fun! In addition to interacting with major game developers, fans will have the opportunity to meet some of the biggest celebrities in the gaming industry. They will also be hosting and promoting nightly parties and concerts as part of the SLGC weekend—access to these events will be free with purchase of a 3 day pass. The main goals of SLGC are to provide as much fun as possible to convention goers and to eliminate the less pleasant aspects of a con. SLGC will provide constant entertainment throughout the weekend offering entertainment, attractions and activities for everyone and anyone interested in attending the con. So when exactly is this amazing convention? August 6th – 8th 2015 and will take place at the South Towne Expo Center 9575 S. State St. • Sandy, UT 84070. Tickets start at $20 (for a single day pass), $25 (3-day pass), and $75 (for a VIG pass). So far, Steven Ogg (AKA Trevor Philips from Grand Theft Auto V), Amber Goldfarb, Elias Toufexis, Nicki Rapp and more special guests have been announced. If you live and breathe for video games, this is your kind of convention! Make sure you get your tickets now and get ready for a fun-filled day of video games! Don’t think for a second I wasn’t going to offer you all something totally AMAZING! 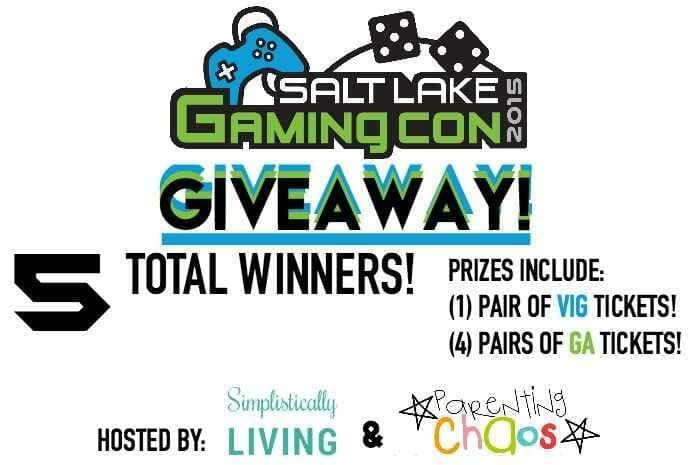 Salt Lake Gaming Con is giving you the chance to win 1 of 5 prizes! 1 Lucky Winner will win 2 VIG Tickets to the convention. 4 Additional Winners will each win (2) General Admission Tickets to the convention! How awesome is that? Entering is simple. Just use the Rafflecopter widget below. Giveaway will end on Monday, August 3rd at 12:00 AM MST. Open to US. The winners will be announced August 3rd, 2015! Disclosure: Work Money Fun is not responsible for prize fulfillment. This giveaway is sponsored by Salt Lake Gaming Con.